Sound Art™ introduces an entirely new way to listen to music in your home or business, letting you enjoy personalized, custom artwork, as well as high-performance, wireless sound. As an early adopter and partner of Onsia®, we transcend traditional ideas of art and sound and revolutionize the way people enjoy music. We then include the highest quality of visual art to the dimension of sound through cutting-edge technology. The technology developed by Onsia®! We refuse to duplicate or imitate when we can innovate. Thus, Sound Art™ is powered by Onsia® speakers. Sound Art™ is unique in many ways, including the use of flat panel speakers rather than traditional “cone” speakers, and we combine art and sound by concealing these speakers behind any type of art that you choose and we print. As the Bluetooth speaker technology was developed for the Sound Art™ speakers, the result was a breathtaking new product that combines visual art with quality sound. Now you can supply your own art, family photos, or favorite scenes. We would love to be part of the selection process with you. Then hear your favorite music, which you select using your cellular telephone. Our canvas printing is award winning and is available in a large variety of sizes. The reproduction of sound is unbelievable! By now everyone is used to wireless communication. Some of this communication you may have even noticed. This includes radio receivers and television sets that pick up programs beamed through radio waves hundreds (possibly even thousands) of miles through the air. Your cell phone uses similar technologies to carry calls. If you use Wi-Fi (wireless Internet), your computer sends and receives a steady stream of Internet data that communicates through the world wide web (www). OK, so I’m sold but what about the art? We have multiple ways of satisfying just about everyone. . . .
First, if you already have a favorite photograph, a piece of art, or if you just have a design you love, simply download it us and we’ll take it from there. We also keep adding our best selling photos on our media gallery and you might want to choose one of those. Are you an Arizona Wildcats fan? Pick a logo and a design. And why not play a fight song and a variety of music from the Pride of Arizona through your Sound Art. Go ahead! We dare you to top that one for yourself or as a gift. Our delivery makes others seem slow. That is if there was another product like ours. How about 1-2 business days. From 9×11 inches up to a whopping 36×48 inches. Want something bigger? Absolutely! It’s a custom, and let’s talk about it. A lot less than you think. Obviously it depends on the size, but we think we can satisfy you. 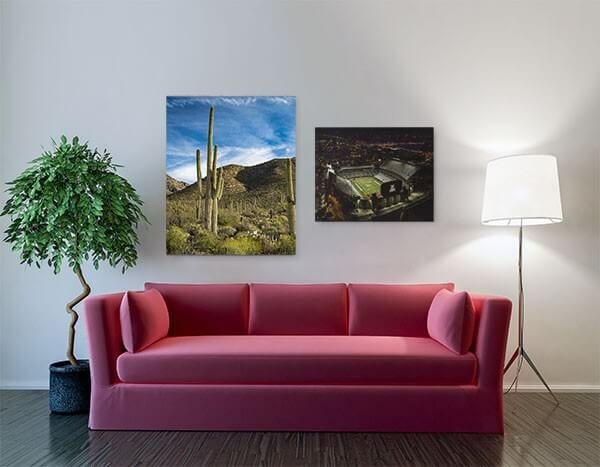 Most clients return and buy more canvas prints for other rooms in their homes or offices.